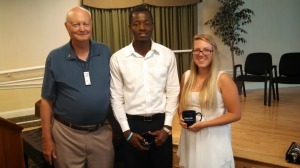 President Art Walz with scholarship recipients Kwadwo & Connor. The Woodbridge Rotary Club selected their 2014 scholarship recipients. This year’s recipients were Kwadwo Bonsu and Connor Sadler both from Potomac High school. Each will recieve $2,000 to be able to use for college tuition. Kwadwo is a student from Ghana. He works hard to improve his English skills and takes his academic work very seriously. His mother works as a custodian supporting his 3 other siblings. Kwadwo helps to take care of them all the while striving towards academic achievement. He loves soccer and hopes to become a minister. he will be attending NOVA and transfering to Radford later on. Connor Sadler a girl from Potomac HS, an honor student, who lost her father to lung cancer 2 years ago. Her mother and 3 siblings have strong financial concerns. She hopes to honor her fathers memory everyday by getting a college education and giving beck to others. She will be attending VA Tech. She loves their motto “Ut Proism- That We May Serve” and quoted Gandhi in her application: “We must become the change we want to see in the world” . This entry was posted in Uncategorized on September 15, 2014 by Jo Ellen Benson.